A great blessing is being bestowed, love is being offered. The emotions are being stirred and everything is possible. There is so much potential represented in the Ace of Cups Tarot Card. How exciting and lovely it is when love is offered. The heart can be touched, if it is open enough to be touched that is. 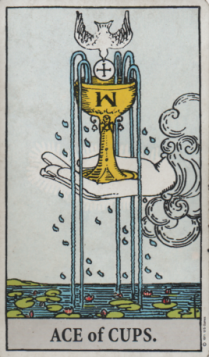 In the Ace of Cups Card, the symbol of the bird above the cup seems to me to be giving a blessing. The circle with the cross reminds me of a communion wafer. The bird represents a dove, the messenger of hope and peace. The cross represents the spirit reaching to earth and “crossing” through the human body/the physical plane. The horizontal line represents the physical, the earth, the material world. The circle represents the whole, universality and connection. The Ace of Cups is saying that what is being offered through love is nothing less than divine. The cup/the vessel/container of love can be a person, thing, situation, job, animal. The way the emotion of love connects you with everything and everyone else. How love dissolves barriers and unites people. How the emotions link you with the mysterious ebb and flow of life. How the emotion of love can take you outside of your ego centred self. Whose is the hand that is offering this gift of love? For in whatever way love comes to you, it is part of the One Source of Love. Love is calling for the small sense of self to dissolve into the whole. The Ace of Cups is full of potential. What are you going to do with this precious gift that is being offered to you? I hope you have enjoyed this post about the Ace of Cups Meaning.